VCU Insight Professor Moose Video - Walter S.Griggs on YouTube Walter S.Griggs, a friend and moose soulmate (although we have never met personally yet), is teaching history and honors courses, business law and served a associate dean at the Virginia Commonwealth University (VCU) School of Business in Richmond, Virginia. Impressive enough. But his heart beats for our common friends - the moose. You find references to his books about moose in the moose books section. Yes! One of the best websites about moose is back online !! Thanks, Randall! A must-view site for everyone interested in moose! www.alces-alces.com Eine umfangreiche Sammlung von Informationen zum Thema Elch - Wissen pur - Genial! www.moosegarden.com Moosegarden is a private "moosefarm" of a Swede starting some years ago to take care of moosish accident victims and orphans. In the meantime it became a job for him welcoming tourists and offering moosemilk and paper made from moose droppings - Worthwhile a visit !! 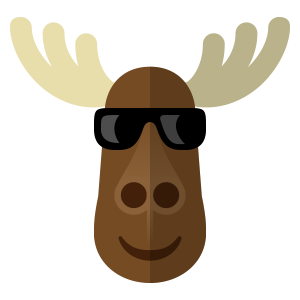 www.mooseys.io mooseys - Smileys Moosefied - the must for Smartphone users to forget boring emoticons and progress to mooseys.